North Korean leader Kim Jong-un left Pyongyang on Saturday afternoon to take the scenic route aboard an armored train to the Vietnamese capital of Hanoi, where he meets with U.S. President Donald Trump. Kim makes the 60-hour, 4,500 km journey through China to northern Vietnam even though it would have taken just four hours by plane, apparently in order to milk the trip for maximum publicity and show off his close ties with China. The epic journey conveniently diverts attention from the fact that there has been little progress in pre-summit negotiations about denuclearization while most of the attention has been focused on the location and venue. North Korean officials see off their leader Kim Jong-un (center) as he takes a train to Vietnam in Pyongyang on Saturday, in this grab from the [North] Korean Central News Agency. According to North Korean state media, Kim boarded his armored train at around 4:30 p.m. Saturday. His sister Kim Yo-jong, Kim Yong-chol, who is a vice chairman of the Workers Party, Foreign Minister Ri Su-yong and other key officials are also on board. At around 9:30 p.m. Saturday the train reached the Chinese border city of Dandong, where Kim got off the train and shook hands with a person who appeared to be Song Tao, the Chinese Communist Party's head of international liaisons. Contrary to expectations, the train apparently headed straight to Vietnam through Tianjin without stopping in Beijing. Kim's wife, Ri Sol-ju was not in the entourage announced by the North Korean state media, but it included Kim's sister Yo-jong. The North Korean media reported Kim's journey before it is complete, a rare departure from the usual practice of waiting at least till he has arrived to minimize safety risks. Kim seems to have chosen this cumbersome means of travel to show off his newly warm ties with China, where each part his train trundles through will require massive security presence. Kim is expected to reach Dong Dang, a border town in northern Vietnam, on Tuesday morning. He then makes the rest of the trip to Hanoi by car. Vietnam has already beefed up security along the border and spruced up a train station there. 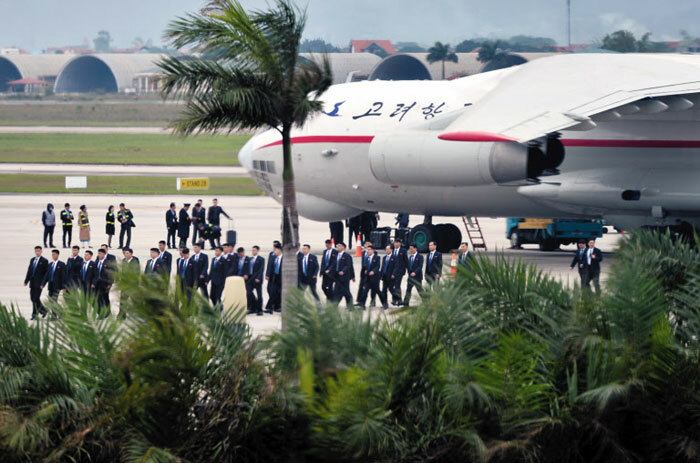 Around 100 members of Kim's security detail already arrived in Vietnam by plane, according to local media. Meanwhile, Trump is also leaving for Hanoi on Monday. Trump expressed optimism about his summit with Kim and said that Kim "realizes, perhaps better than anyone else, that without nuclear weapons, his country could fast become one of the great economic powers anywhere in the World. Because of its location and people (and him), it has more potential for rapid growth than any other nation!"